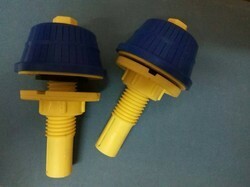 We are a big manufacturer & supplier of Nozzle. We care manufacturing and supplying pp inject type mechanical filter nozzle that includes flower type filter nozzles as well as water filter nozzles. These are available in different shapes and sizes and can be availed to our clients at affordable prices.Nozzle is always in stock. PP, PVDF, Glass filled PP and etc. Standard design with accessories like Check Nuts, Washer, Expanding Self Locking Nut etc.